Sitting and burning calories at the same time? The swopper FIT app makes it possible. It shows how active sitting on the swopper works. The all-rounder of the swopper family and consists of a cast-iron foot ring, a spring strut with adjustable steel spring and a convex-shaped, padded seat. 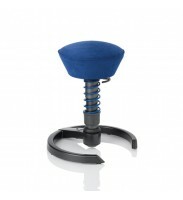 Height, spring hardness and sideways movement are individually adjustable. Available in various high-quality cover materials. 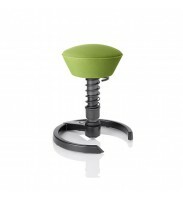 How the swopper Revolutionised Sitting! Designed and developed in Germany by husband and wife te..
A special ergonomic saddle-shaped seat in combination with the 3D movement of the swopper makes a great partnership. A person sitting on a saddle seat automatically assumes the position that produces the least stress for muscles, ligaments and joints, and so relieving stress on the lumbar discs and spine because the pelvis is properly positioned and stabilised. The pelvis is central and cri.. The new lightness of sitting! The very latest in swopper’s innovative designs is the swopper AIR, offering feather-light sitting comfort for those looking for softer cushioning in a seat. Made with 3DEA high tech cushioning that is heat regulating, pressure relieving and a breathable mesh material cover with a very modern look. 'Air' Cushioning Technology Cover: Breathable net struc..